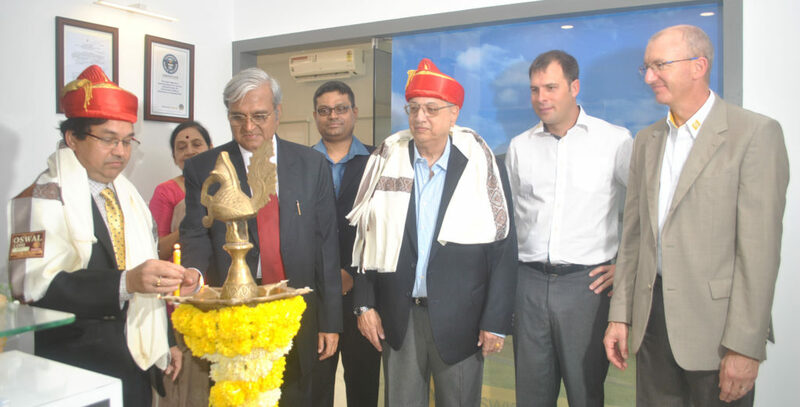 Pune 11 October 2018 : Sylvac India , subsidiary of the Swiss manufacturer Sylvac SA today inaugurated a state of the art training center at Hadapsar Industrial Estate in Pune . The facility was inaugurated at the hands of Chief Guest Jimmy Panthaki , Past MD Eagle Burgmann India Pvt Ltd , Guest of Honour Anant Kelkar Sr Director , Business Operations Honeywell Automation India Ltd in presence of Swiss directors Eric Schnyder and Mr. Didier Gogniat and Arun Kudale Director Sylvac Metrology India Pvt ltd.
With this new facility , Sylvac India has moved to a bigger, state of the art premises of 2000 Sq.ft. in Hadapsar industrial Estate, Pune 411013, after 4 years of dedicated service to the Indian Industry.This new premises will provide all Sylvac products and will also provide a training facility for hands on experience to the marketing persons as well as the customers. The end users from various industries will be given training on handling these instruments for precision measurements on the shop floor on request from the industries.The customer care activity including repairs, maintenance, warranty claims, calibration etc. will also be handled through the same facility. Sylvac SA headquarter is located in Crissier, near Lausanne in Switzerland. They are renowned manufacturer of precision instruments, categorised as smart digital measuring instruments such as Dial gage, Calliper, Micrometre, inside micrometre, Height gases, Bevel protractors, Linear probes, Digital readout system etc. Most of these instruments are equipped with Bluetooth facility for transmitting the measured dada within the periphery of up to 15 meters on the shop floor. The Bluetooth technology implemented in Sylvac instruments is very compact and unique. It has become very popular in the Indian industries for establishing industry 4.0 norms for automation in production.They also manufacture scan and Visio, non-contact type measuring machines, used for inspection in mass production. The Swiss products are quite precise and widely received in the country. They have 16 agents and dealers all over the country to cater to the discerning customers. Sylvac products have received approval from the wireless protocol authority of India and also from the Director of Legal Metrology, Govt. of India.